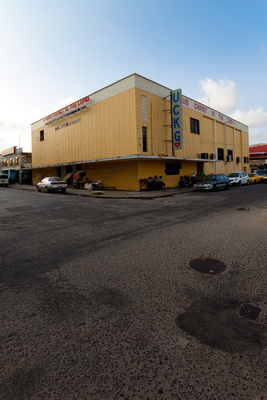 It recently dawned on me that there may be only one functional cinema left in Georgetown, possibly only one left in Guyana. 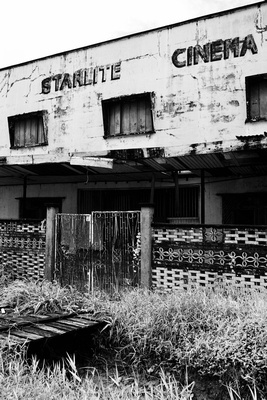 While the television and computers, handheld media players and the internet have certainly impacted on how we watch our movies, the cinema has always had a big draw for people, however the cinemas in Guyana have steadily gone into disrepair and certainly some have disappeared. While we can place a lot of blame of the modernisation of media viewing, the owners and promoters of our cinemas have to take some of the blame, even when I was much younger, and the cinemas were full of moviegoers, I remember the sordid states of the seats, the persevering smell of urine, and the sound of the rodents running around the aisles. 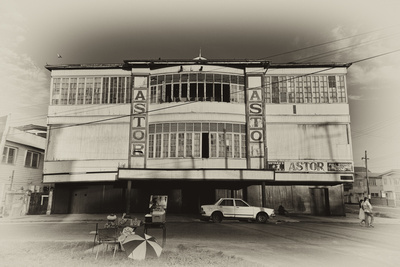 The Astor Cinema, still functional as of this year, but attendance makes it hard for the proprietor to keep it up. 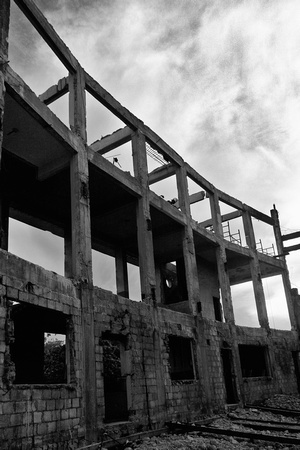 What prompted this blog-post was the sudden nostalgia I got (I am probably getting like Godfrey) when I was processing a photo I took of the partly demolished “Globe Cinema” and an image of the abandoned Starlite Cinema. Both of those images are included in this post. As the Astor is the last remaining cinema, I think that I should make an effort to get permission to do some photography in that establishment before it too disappears. Click on each image to see them larger in their respective galleries. With the way Guyanese are starved for entertainment (have a look at any Main St. Lime, any GuyExpo, any Saturday or Sunday at the seawall, any concert, etc) I find it hard to believe that a decent cinema couldn’t make a go at it here. I think if they had made some effort to keep up with the times they would not have perished. Unfortunately, it is typical of Guyanese businessmen to want to squeeze blood out of a stone, investing and improving is for when they expatriate the cash out to Miami or wherever they have their real homes. Nice pics and commentary Mike. I remember being in packed crowds pushing and shoving with the parents to get into Liberty cinema when I was much much younger. You and I and some of the others did go to some movies at Strand, or Globe, or both, or Kingdom of God or whatever it is now. Thanks Cecil, The investment in something like a multiplex would be enormous by Guyanese standards, and parking? No one usually thinks about parking when they build these days, the last time I saw with that foresight was Buddy Shivraj at his “Hotel” and the “Pool Hall:, and then there was the DSL stores 🙂 Someone once mentioned that City Mall was planning a multiplex at the top, but that was before the new owners, that project may have been shelved, if it ever existed. Great pictures Mikey. I never did go the cinema in Guyana when I lived there. I just never went. I knew where they were. Always crowded with long lines outside just to get tickets. I guess the cinemas are going the way of other technologies being phased out of regular use: the VCR, the CD player, the record player and many more. I think the lack of attendance and upkeep of running a cinema or theater is the main factor in the decline in Guyana. Here in the US, Cinema is growing while movie rental stores are the ones struggling to stay open while theaters are popping up everywhere. Theaters are still crowded and sold out at times for new releases but theater owners also contribute to that by showing movies in smaller theaters. I suspect the larger ones have problems filling the seats. Movie-watching online is the latest battle ground with companies only making their movies available via DVD to certain streaming sites while others must wait years to get the rights to the movies. There are a few Nostalgic theaters in Maryland left that show old movies in limited engagements for the same price or a bit more as new release ticket prices. Every now and then they screen a recent movie. I hope someone can make the multiplex work in Guyana. There is no reason it cannot be affordable, clean, up-to-date and financially stable. If a creative mind does not capitalize on the opportunity then cinema may be dead in Guyana. Gaiety Brickdam burnt 1926 – Empire 1935 – Metropole 1936 – Rialto – Capitol – Olympic – Starlite Drive-in which opened with Elvis Presley in Blue Hawaii. All are invited to my first themed Nostalgia event ”Reminiscing the Guyana Movte experience 1917 to 2000 ‘- an OPRAH style hands on open Mike entertainment – seeking to preserve, propogate, and promote our Social & Cultural Heritage. Please be my honoured guest. Excuse my soap boxing but we are all on the same crusade. Ya think it easy! Thanks Godfrey! Let me know when it is, we’ll make an event of it! Last time I went to a movie theatre (several years ago), it was so damn loud we had to stuff our ears. Guess I’m getting old just like your old cinemas, although I think I might have quite enjoyed attending a film there. Such a shame. I didn’t know taking money offshore was such a problem there. There are supposed to be regulations to prevent those problems in Canada, but I’m not sure that they apply equally across economic classes.